Outfit release debut album Performance next month, here’s Getintothis‘ verdict on the most highly-anticipated record from Liverpool in over a decade. All roads lead to here. Outfit‘s debut album Performance is perhaps the most eagerly anticipated from a Liverpool band in over a decade. Not since The Coral have a band created such a buzz both in the heart of their home land, the national music press and overseas. The signposts for something special were evident from the off. That first outing on a Kazimier under-card supporting Les Savy Fav saw a string of friends who’d traded under numerous guises displaying an ear for a certified pop nugget yet aligned it with a serrated edge of experimentalism. Angular dark disco reimagined through industrial malevolent ambience. Early outings saw some allies close to the band crave for the overly-arch designs they’d clearly abandoned, however Outfit were on to a winner and with a sold out grass-roots headline festival performance under their belt they acquired contemplative cerebral grooves married to heavyweight punch-the-air choruses and a frenzied acceptance from their peers that this was a band going places. Their rise was inevitable. From early offerings, Every Night I Dress Up As You and Firemen Don’t Fly, a catalogue of stunning singles followed. Released via Double Denim – the label co-founded by former Liverpool University student Hari Ashurst – the ball began rolling with the stunning Two Islands through to the beguiling downbeat mutant funk of Another Night’s Dreams Reach Earth Again (ANDREA) and culminating in a drip feed of tracks from Performance. In an age were digital hype more often than not has little impression on commercial success, Outfit‘s rise to national prominence is yet to be assured. However, with near universal backing from UK print, radio and online music press it’d be wholly justified if this set of gifted, and hugely likeable, set of musicians burst through the dot com bubble. Whatever, the case, Performance is the culmination of all their efforts. A superlative statement of intent – densely packed ideas knitted together with studio craft and intelligent musicianship. We’ve lived with it barely two weeks, however, we’re already sold. 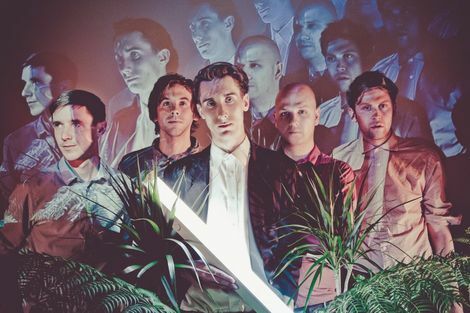 Here’s Getintothis‘ early verdict on Outfit‘s Performance. 1. Nothing Big: Performance‘s opening track sets the tone immediately; fractured glass-trodden beats dance amid low tremors of brass and an undulating trickle of Christoper Hutchinson bass. The feeling is of alienation, claustrophobic melancholy and an acquiescence of being: this is all there is – deal with it. David Berger‘s clicks ramp proceedings up a notch before a sky-scraping chorus pierces through Thomas Gorton‘s dense wall of keys. 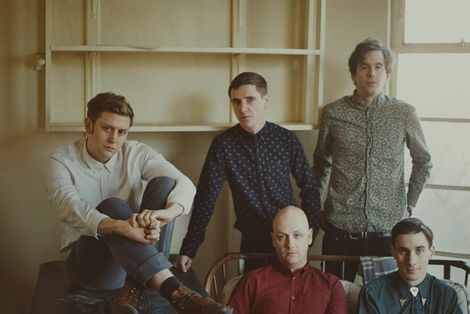 With their roots in English electronic art pop, Outfit have been compared to various obvious touchstones (Hot Chip, Dutch Uncles, Everything Everything), yet this introductory offering is a denser, more progressive affair, more in keeping with a band who’ve attained a real affinity with Liverpool, Pink Floyd. With it’s backward looped guitar theatrics, wistful Northern soul and adventurous experimentalism, Nothing Big finds Outfit setting the controls for the very heart of the sun – it’s an understated marvel of an opener. 2. 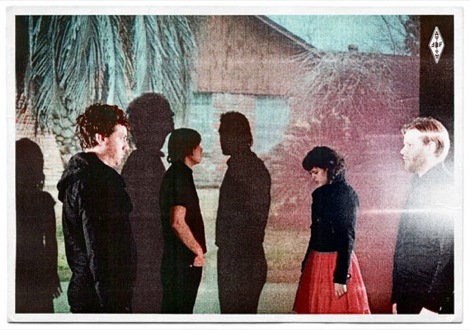 I Want What’s Best: Thumping superlative pop. It’s little wonder the band chose to push I Want What’s Best as the opening single from Performance. Driving Hutchinson/Berger rhythms marry with Gorton/Hunt duel lead vocals to combine on one of the album’s strongest dance-floor offerings. Typically, the band refuse to play it straight, with a middle eight straight from the Italo 70s horrorcore Tenebrae while Hunt’s guitar is twisted beyond recognition – yet this is the sound of a band who know their way around a cute hook and are positively imploring you to get your groove on. 3. House on Fire: Given a debut airing at FestEVOL back in August 2012, there were suggestions this would be the album’s title track. Here the band tighten the funk, apply added pop muscle and dress in further lashings of darkness. Gorton’s synths are pushed further forward in the mix as Nick Hunt’s six-string screeches render the guitar near impotency; this is not an instrument to pluck or strum but disfigure and abuse. It’s a hideous crimson vixen of a tune – three minutes which feel disgracefully naughty. 4. Performance: Signalling a distinct change of pace, Outfit shift into third gear cruising along a meditative highway simultaneously sounding slightly medicated themselves. This warped ghostly ballad waltzes along on a slow tide of rippling keyboards and echo-laden vocal harmonies. At once mournful and reflective it sweeps past in just over three minutes like a red curtain dropping signalling the end of the first chapter. 5. Spraypaint: Bristling from the get-go, off-kilter percussion and an air of disquiet finds Andrew sighing, ‘washing our hands again, chasing vapour to hide it from them‘, before a languid burst of electronica gushes forth. This is Outfit at their wilfully obtuse best, burrowing deep within textured atmospherics and rivers of neo-prog ambience it recalls the masters of early 70s keys controllers Quatermass‘ J. Peter Robinson, Focus‘ Thijs van Leer and Tangerine Dream‘s Edgar Froese. Contemplative and deeply seductive. 6. Elephant Days: Back to the beat-pop of the early part of the album, Elephant Days recalls the angular groove of early b-side Vehicles. All bouncing bass and nifty Berger drum clops it builds into a terrific swell as Gorton’s harmonies mount Hunt’s lead transporting to another pop terrain. Two thirds in, Berger’s industrial rhythms are given an extended workout injecting Nick Hunt’s krautrock soloing with an added urgency – it’s one of Performance‘s few moments of extended instrumental jamming – and the album’s all the better for it. Elephant Days is the sound of a band relaxing it’s smouldering rhythmic vice, cutting loose and ramping up the fun. A genuine highlight. 7. Phone Ghost: Following in the vein of Spraypaint, the band align dense, thick percussion to snaking synth hooks as Nick Hunt casts his cascading industrial wafts of guitar liberally over proceedings. Just as things reach a zenith the sound drops and Andrew’s lone voice sings: ‘Now your sunken eyes are just emeralds that won’t shine, a look that says you’ve nothing left to lose,‘ as once again, the band channel the spirit of Roger Waters‘ Floyd. Perhaps the most sinister offering on Performance, and despite it’s 3.43 running time, Phone Ghost is a heavy listen – perhaps the sound of a band documenting the technological travails of everyday humdrum. Complete darkness in the mundanity of living. 8. Thank God I Was Dreaming: The hefty atmospherics are lifted with this mid-tempo supersonic slice of aural bliss. Light RnB is sprinkled with decorative percussive thuds and more undulating layers of synth. Those aforementioned Hot Chip comparisons are most evident on the gentle gallop of Thank God I Was Dreaming‘s electro-pop trip. Easing in with a radiant summery beat, Gorton’s lead vocal can’t help but recall that of Alexis Taylor while the bass-drum combination could have been lifted straight off The Warning. 9. The Great Outdoors: The levity continues with another sleepy mid-tempo groove diamond. Acting almost as a lead in to the great finale, The Great Outdoors‘ slow build provides the album with a gradual arch; all dewy-eyed romanticism and a yearning synthesis of electricity and organic effects. Like much of Performance it’s infectious, unravelling under your skin as the melody slowly seeps in, warranting repeated listens for the full dramatic flavours to burst home. 10. Two Islands: The track that made Getintothis fall in love with Outfit in the beginning is given a subtle reworking and fine tuning – and all the better for it. Andrew’s vocals are rounded, clipped of the breathy whisper and made all the sharper, while Nick’s guitar knifes through the introductory passage all the while Berger’s drums are weightier, thicker and roll deliciously under the kaleidoscopic haze of rippling noise. The temptation to abandon the track as an early diamond in the rough must have been great yet Two Island is such a powerful statement of intent it couldn’t be ignored – it’s a near-perfect pop tune. A pop tune that clocks in at over six minutes. That towering squall of guitar coursing through the bridge to the chorus is as magnificent as ever, while Andrew’s cry of ‘I don’t know anyone else in here,’ retains it’s euphoric melancholic juxtaposition – and the rush of release when everything boots in together on 3.55 is nothing short of majestic. There’s even space for some additional Hunt vocal gymnastics late on as a stampede of toms crashes over all kinds of tumbling instrumentation as finally Hunt riffs his guitar like the studio’s on fire. To long-time fans of Outfit you’d expect nothing short of magnificence with a finale that includes this kind of track, yet Two Islands isn’t the band’s millstone that some have suggested. Performance works truly as whole, a cohesive arsenal which envelops the listener in something heavy, at times oppressive, yet emotionally profound and evocative, a record which acknowledges how modern life can be rubbish, yet can also be marvellous and magical – it’s just a matter of how you play it. Performance is out via Double Denim on August 12, they play FestEvol at the Kazimier on August 10 – further details here. Electronic Voice Phenomena featuring Outfit: St George’s Hall, Liverpool. 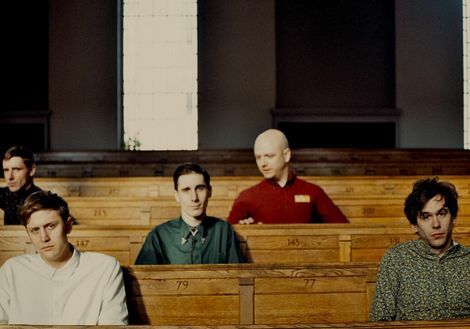 Outfit to play free Liverpool date ahead of new album Performance. 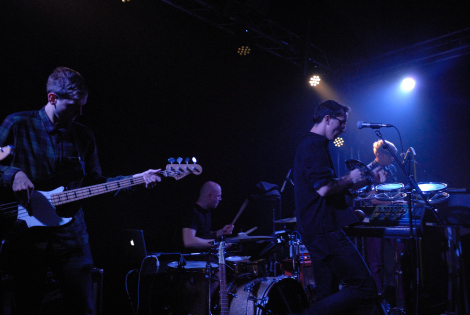 Outfit reviewed live at Liverpool Sound City 2013 at the Kazimier. 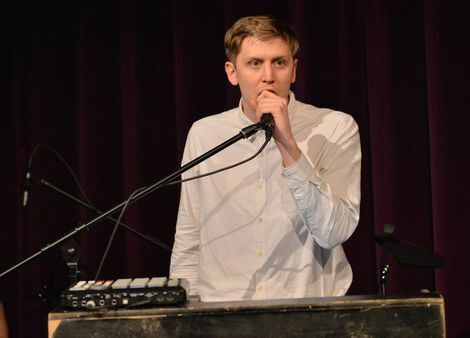 Outfit: Performance – new video, plus Getintothis picture gallery from FACT. Outfit play new tracks at FACT as Performance director revealed. Outfit: I Want What’s Best (demo). Outfit team up with FACT to find video director for new track Performance. 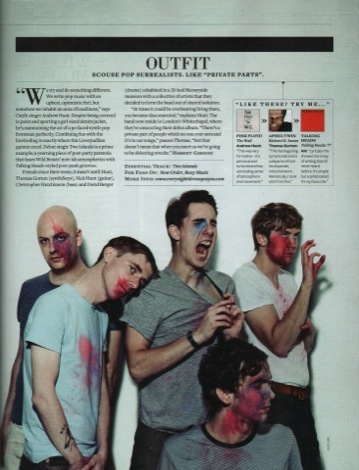 Outfit‘s Everything All The Time features in Getintothis‘ top tracks of 2012. Getintothis reviews Outfit at FestEVOL, at the Kazimier. Outfit: Another Night’s Dreams Reach Earth Again. GIT AWARD 2012: Artist nominee profile – Outfit. Outfit named in the GIT Award 2011-2012 shortlist. 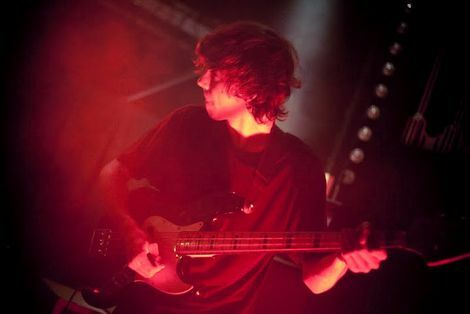 Getintothis reviews Outfit with Real Estate at The Deaf Institute, Manchester. Getintothis on new Outfit track Dashing In Passing. Outfit feature in Getintothis‘ top moments of 2011. 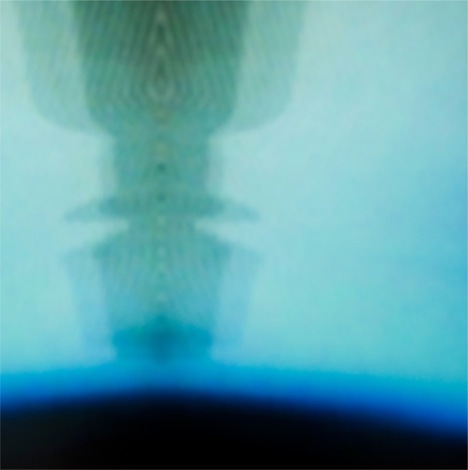 Outfit‘s Two Islands named Getintothis‘ top track of 2011. Outfit announce debut national UK tour. Outfit reviewed at Liverpool Music Week closing party at Contemporary Urban Centre. Outfit to play Liverpool Music Week 2011 closing party. Getintothis exclusive interview Outfit: The Liverpool band the whole world wants a piece of. Outfit: New track Vehicles – flipside to Two Islands revs up for release. 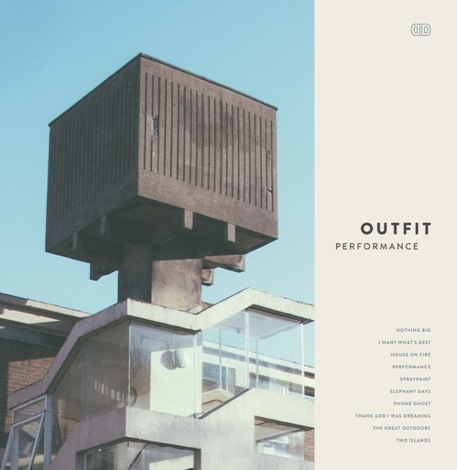 Outfit prep debut single Two Islands on Double Denim Records. Ladytron, Outfit: St George’s Hall – Picture Gallery. Ladytron and Outfit reviewed at St George’s Hall, Liverpool. Outfit named in the Top 10 acts at Liverpool Sound City 2011. Outfit and Stealing Sheep reviewed on Getintothis Stage at Bombed Out Church. Outfit reviewed at Liverpool Sound City 2011. Outfit to play Getintothis Stage at Liverpool Sound City 2011. Outfit named in Liverpool Sound City 2011 ones to watch. Getintothis reviews Outfit at FIESTA OBSCENIC at Wolstenholme Creative Space, May 2011. Getintothis reviews Outfit‘s debut gig supporting Les Savy Fav at the Kazimier, March 2011.